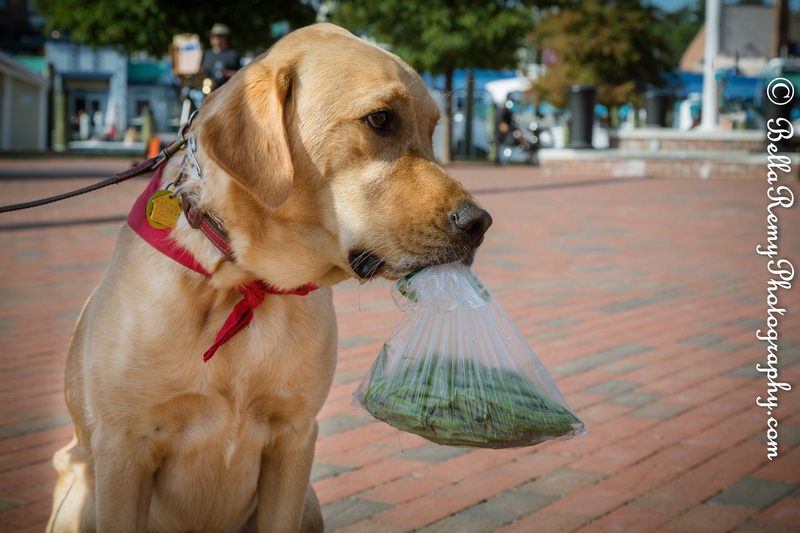 A visit to the farmer’s market in downtown Annapolis on a doggy Sunday morning, fresh green beans were to be had. Of course I had to carry them to make sure they stayed safe. Yum! Can’t wait to get home to eat my greens! This photo put a smile on my face, Bella. Yes, eat your greens! I know some dogs that love their lettuce more than their kibbles as snacks. How was the beans? Perpetua. This was the cutest dog ever and was being trained to be a service dog for someone with disabilities. She had a puppy adopted sister that she was coaching over. The green beans were theirs. They look good though don’t they? I can’t get my eyes off. How wonderful this photo is. So sweet. When I saw this dog walking, you know I had to run up and ask if I could take his picture. He was just so adorable. Thanks Petra for your wonderful German greetings. A D O R A B L E !! Yes he is ! Love your comment Denise. Thanks! Almost makes me want one..oh wait…no I don’t! Since we’re on the topic of dogs protecting food. My friend came down with her 1 1/2 year old doberman girl dog and we had lunch on the sidewalk outside. Once we were served, seemed puppy had a serious need to protect my lunch. Every time a dog would walk by she would growl, bark and lunge at them. Once she felt she did a good job protecting, she’d stick her nose right to my plate to check to make sure it was safe. Then looked at me as if to say..ok, it’s protected, so where’s mine? I have 2 dogs, really love them both! That is wonderful! What types of dogs are they? Annapolis is really a dog town and they all come out on Sunday mornings. Sort of a doggy parade. A black and chocolate lab. The best! Fantastic ! Bet you have your hands full with them. How adorable! He looks just like my dear departed Bramble, but I think he would have eaten those beans! Is that right? I know some dogs really love green vegetables. BTW, how’s your new puppy? Settling down any? I think so too Sylvia! I’m thrilled that I got to see him. Oh that is too funny Renee ! Who knew? Dogs liking strawberries. Smart doggie.